Despite working with a narrow space, this homeowner has turned their modest kitchen into a serene and sophisticated escape from the daily hustle and bustle of life. 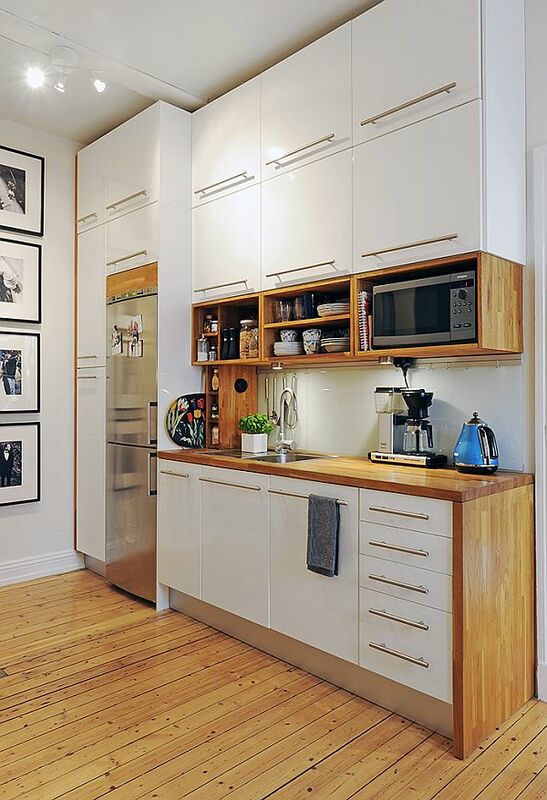 To create a sleek finished look, they paired simple white cabinets with natural wooden countertops and shelving. The finished product is gorgeous and incredibly functional. The overhead track lighting produces the perfect amount of light for this relaxed space. To achieve a similar look, incorporate both synthetic and natural materials to create an atmosphere that mixes the modern and the classic. Sometimes pairing unexpected colors makes for the best home decoration strategy. This homeowner began with lilac walls and a deep cream tile backsplash. The expected choice would have been to work with silver or white appliances and cabinets. However, by injecting black into the space, they created a look that is soft and feminine and yet so very modern. This kitchen looks positively stunning when bathed in natural sunlight, which is why heavy curtains on the window would have been completely unnecessary. The use of a rolling cart is perfect in a little kitchen, as you can push it against the wall or pull it into the center of the room as needed. 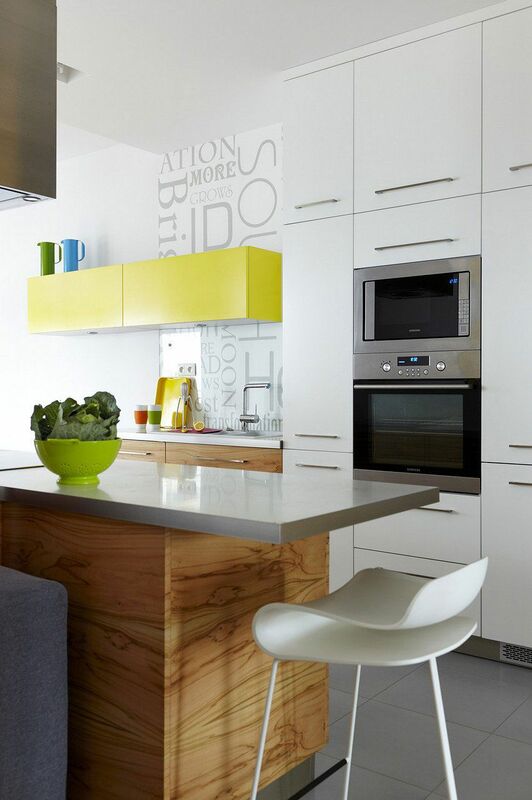 The right artwork can make or break a space and kitchens are no exception to that rule. This homeowner went with a relatively simple design for their kitchen. However, the floor-to-ceiling artwork, featuring a text design, serves as a brilliant focal point. This homeowner isn’t working with a great deal of counter space, but managed to still find some strategic places for decorations and accents. 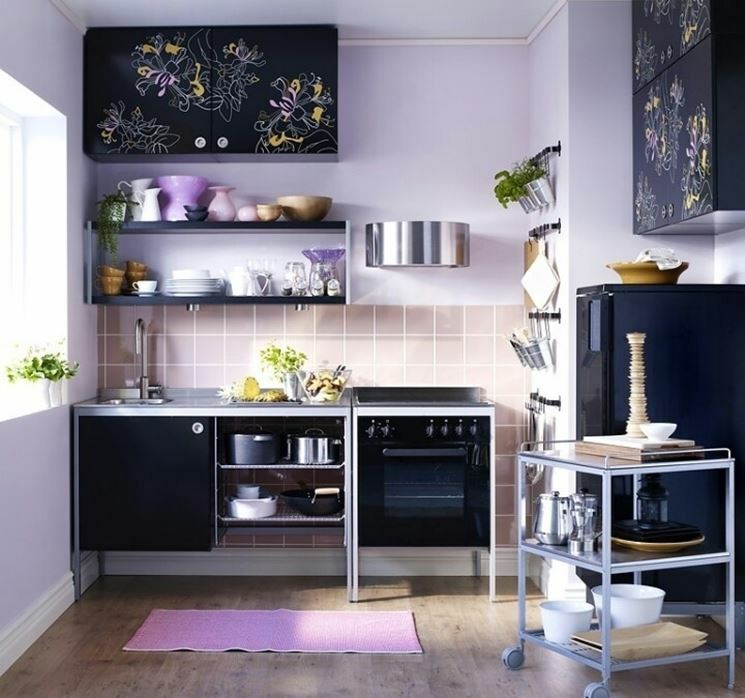 This kitchen serves as proof that you can bring life into any space, no matter how small, if you’re creative. This little kitchen nook would be fairly bland if it weren’t for this homeowner’s creativity. By wallpapering a small section of wall space with the multicolored print, they were able to add some understated but stunning personality to this tiny space. The floor rug features an array of exciting prints in a black and white color scheme, as not to overpower the accent wall. 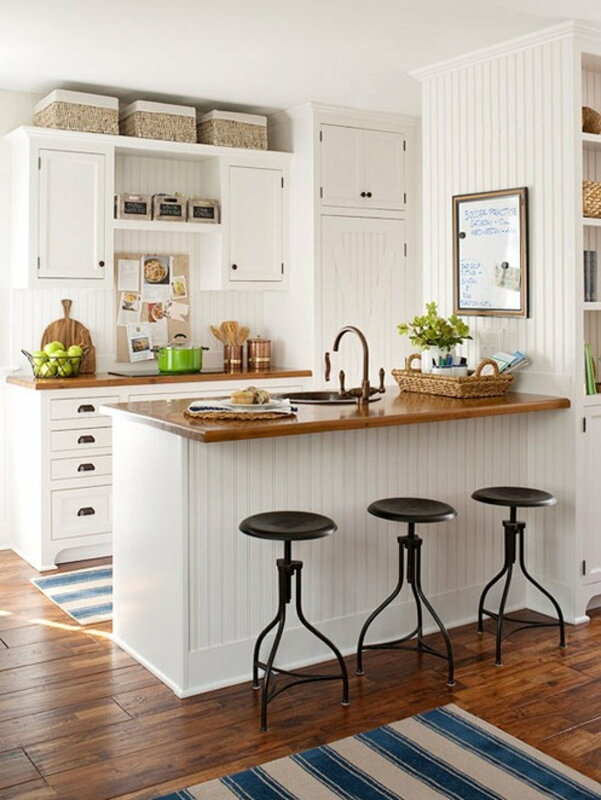 The under-cabinet and overhead track lighting give this mostly white space a positively stunning glow. 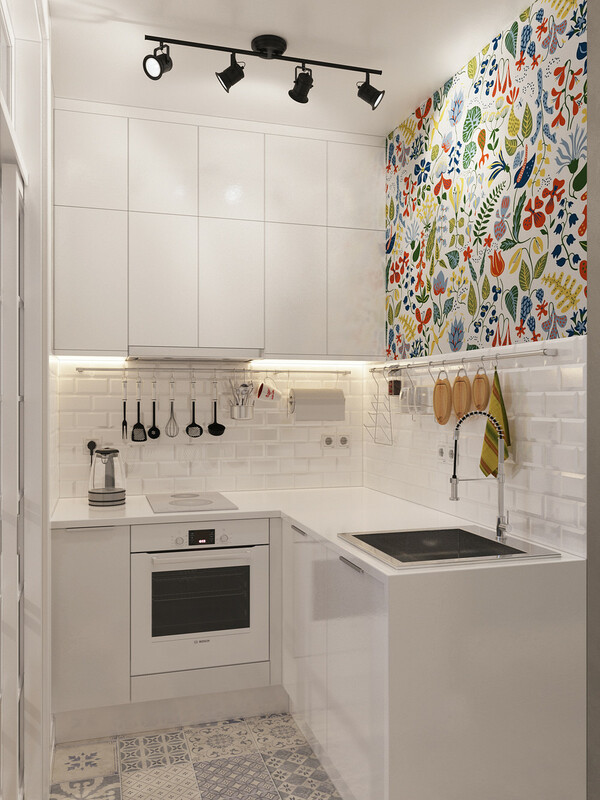 By hanging utensils, these kitchen tools are both stored functionally and made a part of the decor. When researching small kitchen ideas, you won’t see a lot of “mysterious” options. However, that’s the best word to describe this homeowner’s innovative design. 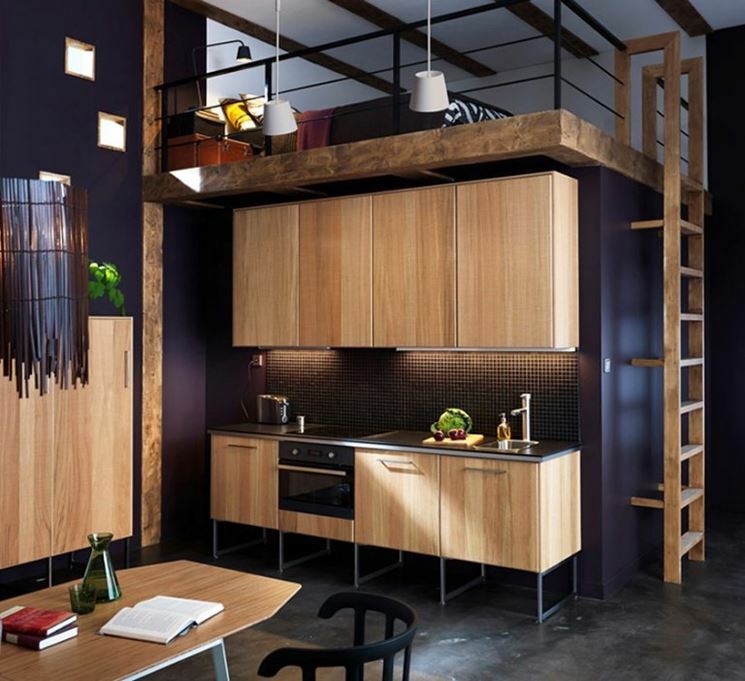 This little kitchen nook exists in an open concept loft, which could pose a decorating nightmare for some. However, by using light wood for their cabinets, they created an area that stands out without clashing from the rest of this very dark loft space. Evocative of the modern designs in boutique hotels, this gorgeous kitchen area brings a soft element to this very dramatic space. Gray can be a difficult color for designers. When done right, it can create a very sleek and modern look. When done wrong, however, it can be cold and uninviting. This homeowner was clearly going for a country home-inspired look and these dark gray cabinets may not have been an obvious choice. However, by lighting the display cabinets and allowing natural sunlight to pour in through the window, this kitchen is rendered bright, airy and inviting. The gray actually adds some color and personality to what would have otherwise been a very simple design. 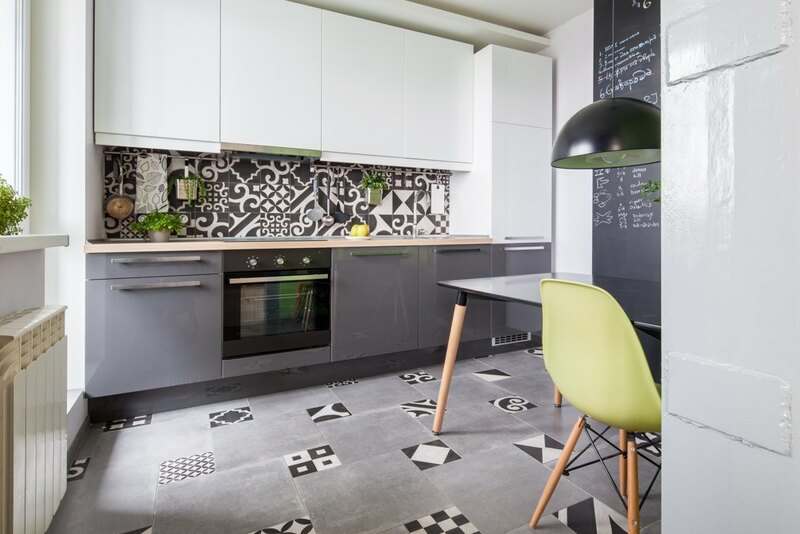 A black and white color scheme might feel unexpected for a kitchen, but it is truly a joy to work with. 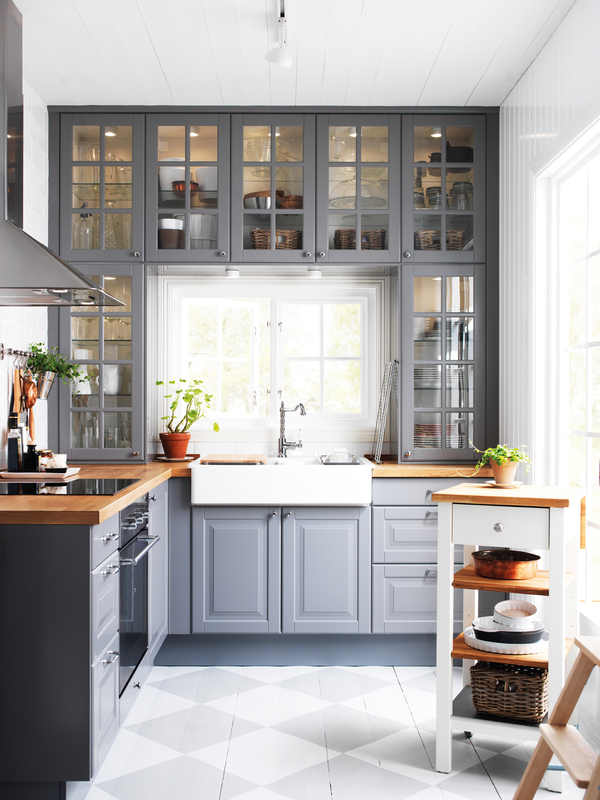 This homeowner chose white for their upper-level cabinets and chose a deep gray hue for the lower cabinets. The backsplash is an exciting black and white print that captures the eye wonderfully. As seen in many modern black and white designs, little colorful accents are used to offset the simplicity of the space. In this case, the soft yellow chairs at the kitchen table work beautifully against the blacks, whites and grays. While modern and sleek designs tend to dominate lists like these, just about all of us have a special place in our hearts for those cozy country designs. This tiny little kitchen features original cabinetry and a retro stove. This homeowner chose to work with the country feel instead of against it. 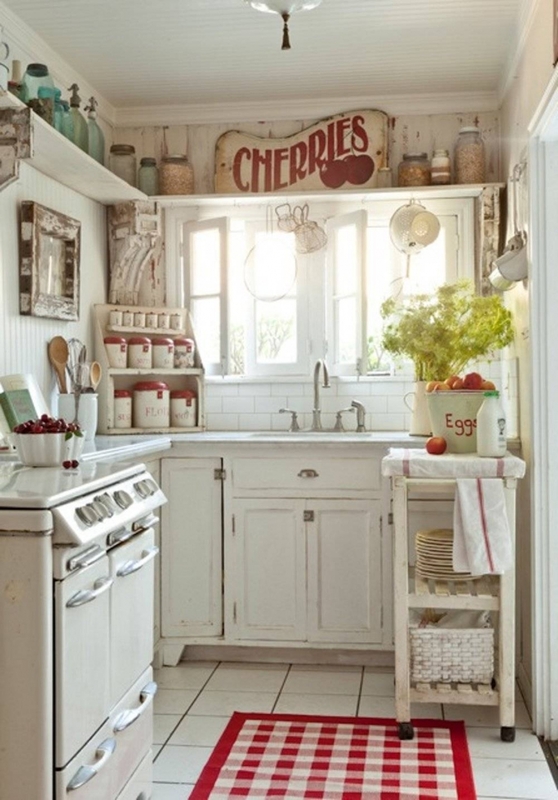 The space is adorned with rustic knick-knacks, complimented by a classic red and white gingham rug. The finished look is soft, inviting and feminine. Modern designs are exciting, but these rustic country-inspired kitchens are classic, cozy and welcoming. Everything about this kitchen screams functionality for a busy family. From the dry-erase board to the bulletin board above the sink, this homeowner’s design proves that you can create a kitchen that is functional for your family’s needs without sacrificing style. While the walls and cabinets are kept in a simple white hue, little accents like the striped blue rugs inject some color into the design. Take inspiration from this design and find ways to make those basic family necessities, like chalkboards for grocery lists and reminders, chic and sophisticated.